It’s wintertime and the baking is easy. It certainly appeals to Rosie and me, which is why this is our third-in-a-row recipe using muffin tins — or an 8×8 baking pan! See Rosie’s pepper jack popovers and my bran muffins. 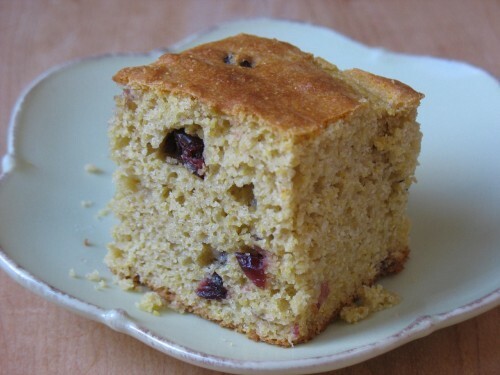 This cornbread recipe is my go-to favorite, for corn muffins too. Lightly sweetened, low fat, rather crunchy. Angostura bitters adds a distinctive, rich flavor. Similar to the biscuits I developed, Angostura bitters brings depth that takes this cornbread beyond routine. Use a cornbread mix if you like; just stir Angostura into the liquid ingredients. That’s what makes the difference here. Preheat oven to 375°F for cornbread, 350ºF for muffins. 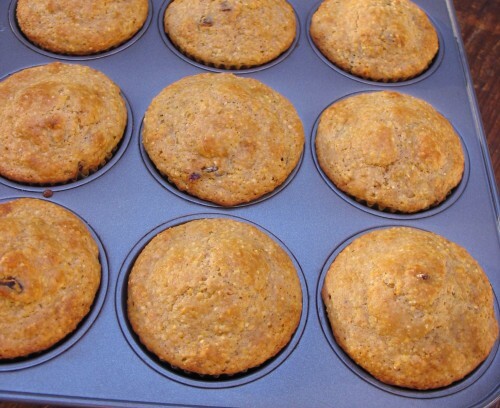 Grease an 8×8-inch baking pan or muffin tins (15 muffins). In a large bowl, mix dry ingredients with a wire whisk (flour, cornmeal, sugar, baking powder, baking soda, salt). Stir in cranberries, separating berries with your fingers, if needed. In a separate bowl or measuring cup, whisk together buttermilk, eggs, butter and Angostura. Add to flour mixture, stirring gently until moistened. Pour into pan; let rest 5 minutes. Bake 25-30 minutes or until toothpick inserted in center comes out clean. If using a glass 8×8 baking dish, bake at 350°F for 30 minutes or until tests done. Recipe makes 15 muffins. Bake at 350°F for 15-20 minutes. Muffin texture is not as moist as 8×8 pan, so use 4 Tbsp. butter if desired. Brands of cornmeal vary; some are coarser than others which affects the texture of the cornbread. If you’re short on time to let buttermilk and eggs come to room temperature, immerse unbroken eggs in a bowl of warm water for 15 minutes. Microwave buttermilk on medium power for 1 minute. No buttermilk on hand? Powdered cream of tartar is a good buttermilk substitute. For this recipe, whisk 2-1/4 tsp cream of tartar into the dry ingredients; use whole milk instead of buttermilk. OR… Stir 4-1/2 tsp white vinegar or lemon juice into whole milk; let stand 10 minutes for milk to curdle. A bit of acidity will be apparent in the cornbread flavor. Use 1/3 cup sugar if you like cornbread on the sweeter side. Don’t have cranberries on hand? Use raisins or currants, or chop up other dried fruits. This looks like a terrific way to use Angostura bitters! Thanks to your ideas, I now have some in my pantry. Pinning this to make with it! Glad Angostura is in your pantry now, Susan. 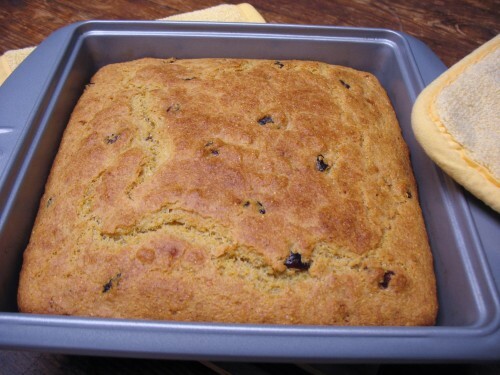 I really like this cornbread and plan to make two batches of corn muffins this week. If you’re in the mood for biscuits with Angostura, try that as well. Bitters is a game changer for some of these “everyday” foods. It’s really good to know that! Thanks for the extra idea. I’ve got a cheese biscuit recipe I’ve been wanting to try that could be a good candidate!